Happy Saint Patrick's day, plus one! I hope all are doing well this lovely Saturday evening. I know it's still winter for many of you east of the Mississippi, but here in Arizona it's just been another boring rainless, snowless winter. I suppose I should not complain, but I still do! I had another busy work week, but I made time to go last week to the annual Book Fair here in Tucson. It is a huge event here, and one of the largest in the country. I wanted to go and speak to specific publishers I saw on the list of attendees. I have been bombarded by countless publishing companies since I first inquired years ago. Although they have been more persistent since my cross-country tour, I now know which companies are just after people's money. Many of those companies also set up booths at fairs like these, but have no interest in people's writing or stories other then to take their money. I have spoken to many of these via email or on the phone, and when all is said and done, it becomes apparent that the only writing they're interested in his a check made payable to them! I spoke to a few reputable publishers, and explained that my manuscript was still being cleaned up at the moment. They seemed interested and asked me to send them excerpts of the book, and I can't wait to get that part of my story rolling. Unfortunately as you know, my book is held up at the current moment as the proofreader deals with a personal tragedy in her family. I will be sure to give you the latest update as things develop. 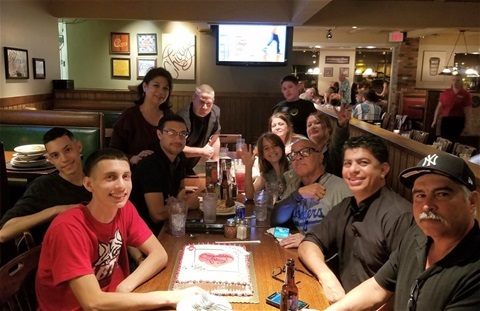 I also spent last Wednesday evening celebrating a special event with my son Jonathan and the family. His mother and I planned a surprise dinner at a local pizzeria to celebrate his new career as a blackjack dealer at the local casino. I suppose it might not be the ideal career path a parent would want for his child, but Johnny has always been a whiz at math and I am please to see him get out of the trades as a fitter and go into something vastly different. It's not easy for people of any age to change their course in life, especially once people are settled and feel trapped in their career choices. But since he is young and single, it is the best time to make a change. Whether or not this turns out to be a long-term career or just an adventure for a 25 year old remains to be seen, but he has always been a good son and has made great choices his entire young life. He was totally surprised by the gathering, and humbly thanked everybody for thinking of him. I'm sure he will excel and his new job, as he always has his entire life. Thank you once again for checking in, and continuing to support my efforts to finally see this journey to its completion. I think I could see the the light at the end of the tunnel now, I'm just hoping it's not the train coming in the opposite direction! Until next week my friends, stay safe and enjoy the first day of spring wherever you call home.